Picture yourself on the rugby field, and you’re the only thing between All Black Jonah Lomu and the try line. He stood at 6’5”, weighed 120kg, and ran the 100m in a lazy 10.7 seconds. It’s hard to imagine a more frightening sight. He could play the power game, the speed game, and he could step. He was the ultimate competitor. Mace wheat, on the other hand, is agile, dependable, and can play the yield game, but its ability to compete with weeds is limited. However, yield is king, and hence Mace has been an extremely successful variety where weeds are under adequate control. What if we could have a wheat variety that could play the yield game and the competition game? What would that look like? Perhaps a dwarf wheat, with a long coleoptile, prostrate growth habit (like barley), early vigour, leaves like solar panels, and of course, high yield. Well, that’s exactly what wheat breeder, Dr Greg Rebetzke from CSIRO, is attempting to develop as part of a GRDC-funded high vigour wheat project. High vigour kinds of wheat are not only good for competing with weeds; they also serve to shade the soil to reduce evaporation and ultimately increase water-use efficiency. If he is successful, Greg might like to name the first high vigour wheat variety Jonah! To find out how this breeding program is progressing, and what difference high vigour wheat makes to ryegrass seed set, read on. Why is crop competition with weeds such a big deal these days? Back in the day, when the herbicides all worked, we didn’t need to focus on crop competition with weeds. If weeds were present they were sprayed and they died. Things have changed a little now and herbicide-resistant weeds are an everyday part of farming life. Now we need to make every post a winner, and we need to do everything we can to reduce the seed set of the weeds. Competitive crops suffer less yield loss from high weed pressure. Several weed species are now more dormant and emerge later than they used to. The weeds have adapted to avoid the knockdown and pre-emergent herbicides. Late emerging weeds will suffer at the hands of a competitive crop. Reduced row spacing, east-west sowing and higher crop density are all valuable tools to increase crop competition against weeds. Growers are also prioritising early vigour when selecting crop types and varieties for weedy paddocks. But the most competitive varieties aren’t always the best for yield and other agronomic traits. 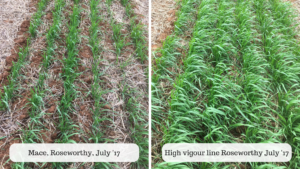 Through a pre-breeding program, Greg is producing ‘weed competitive elite wheats’ with desirable agronomic traits by crossing selected high vigour (HV) lines with favourable commercial varieties. Importantly, the HV lines have been bred using 28 overseas high vigour wheat varieties for more than 20 years at the CSIRO in Canberra. These lines also incorporate new dwarfing genes that reduce plant height (minimise lodging) but maintain coleoptile length for deeper sowing. There were 68 ‘HV’ spring wheats developed by CSIRO from high vigour sources were evaluated for weed tolerance (yield loss in presence of weeds) and suppression (of weed-seed production) against 18 commercial cultivars in South Australia over two seasons (source: Zerner, Rebetzke & Gill, Genotypic stability of weed competitive ability for bread wheat genotypes in multiple environments, Crop & Pasture Science 2016). Some of the HV lines provided >50% greater weed suppression than the commercial cultivars. Michael Zerner and Gurjeet Gill from Adelaide University assessed some of the early lines from this breeding program and found that ryegrass really didn’t enjoy growing amongst these triffids of plants! This and other research shows that at least a 50% reduction in ryegrass seed set is common when comparing high vigour wheat and barley lines with current commercial wheat cultivars. The GRDC project led by Greg Rebetzke is continuing to further develop HV lines, and with support from colleagues Gurjeet Gill and Bob French, use selected lines to breed elite spring wheats with the competitive trait for use in commercial plant breeding. 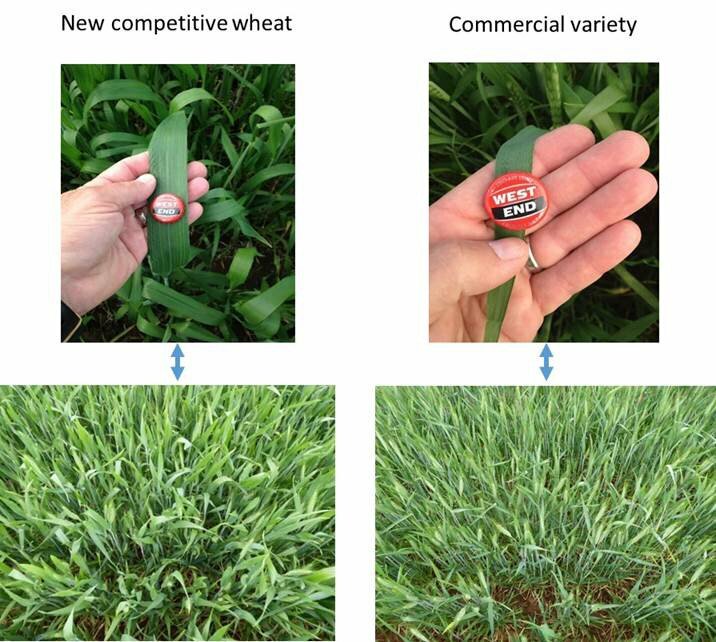 Many hundreds of crosses have been made in consultation with Australian commercial wheat breeders, and over the next 2-3 years identify and release to breeders potential competitive breeding lines with the objective of hopefully developing a high vigour, high yielding variety, complete with all of the other desirable traits that modern varieties must contain. Such long-term and risky research requires dedicated funding support and hence the willingness for GRDC to partner and provide support for the research. The project is also assessing HV lines used in conjunction with other competitive tools, including seeding rate and row spacing, and how HV lines perform against different weed species. These trials commenced in 2015 at Roseworthy (SA), Condobolin (NSW) and Yanco (NSW). Unfortunately, the 2016 trials were seriously affected by flooding. We’ll follow up results at the conclusion of the project. Instinctively all growers know that crop competition is desirable, and it can be hard to achieve through adjustments in seeding rate, row spacing and orientation. While there’s still considerable work to do in this research we look forward to the future release of the high vigour line, ‘Jonah’ (and a few ‘Wallaby’ lines as well)! Microbial degradation of propyzamide – will we have a problem? When does a seed become a seed?